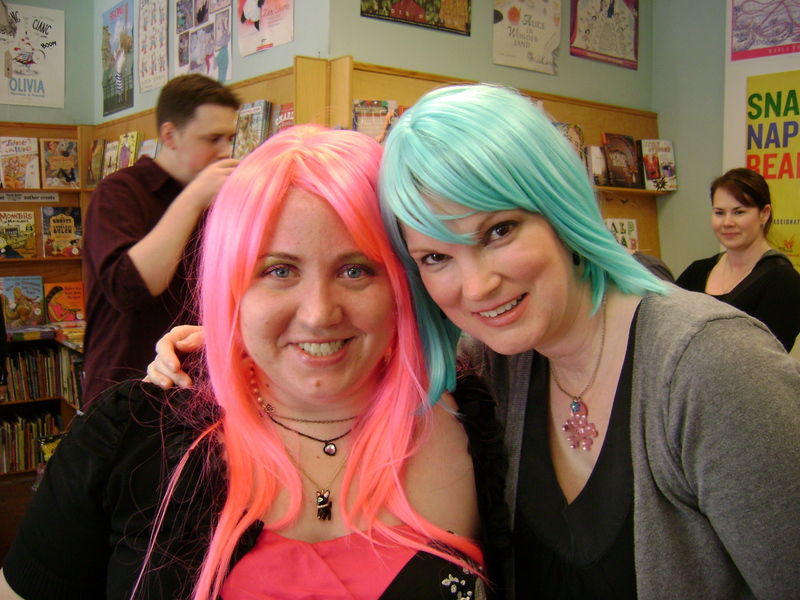 I jumped at the chance to don a colorful wig for the launch of my good friend Liz Gallagher’s second YA novel, MY NOT-SO-STILL LIFE, which came out last week. Ok, maybe jumped is too strong a word. How about I relished the opportunity to go totally smurfy-punk rock in honor of her main character Vanessa, who uses her hair and body as a canvas and expression of her individuality? Hmm… that’s a long sentence. Oh well. So I was a little like Liz’s protagonist Vanessa in high school. Though I never went with blue hair, I did go orange crew cut, short with black streaks, even shorter with big Robert Smith bangs that I used to braid and put a tiny bow in. And then, about junior year, I just decided it was all too much trouble. I got some crap for not having cool hair or dressing in all black, like my “bat caver” friends, the precursor to modern goths. One mean alternative girl orbiting our circle even called me “Rainbow Brite” because my thrift store sweaters were in oranges, moss greens, browns, yellows. Lame. She was a really angry person. I hope she’s nicer now. Anyway, the thing I learned then is that your true friends, friends like my buddy Liz Gallagher now, don’t care how you dress or what you listen to or what your hair looks like. You like hanging out together because you can be your true selves, you can be who you are on the inside. I know that sounds a little after-school special (which I don’t even think they have anymore) but it’s really true. It’s not about being cool, it’s about being you. And if you want to have blue hair, or pierce your nose, or wear circus stripe tights, do it. I hope you’ll check out Liz’s new book, which is a companion novel to her critically acclaimed debut, THE OPPOSITE OF INVISIBLE. MY NOT-SO-STILL LIFE is a quick, touching read that stays with you. In the story, Vanessa desperately tries to grow up and change her life and her friends’ lives, but finds out that sometimes it’s worth being where you are — that you should enjoy the part of life that you’re in and let your friends (and yourself) be who you are at that moment. Here’s a link to where you can find MY NOT-SO-STILL LIFE — I hope you’ll check it out! “Lame. She was a really angry person. I hope she’s nicer now.” Heather, that sums up so much of the hard parts of adolescence and the triumph of growing up! I loved how THE OPPOSITE OF INVISIBLE really highlighted maturity that is important and fulfilling (finding out who you are) vs. what we might feel pressured into too early (sexual relationships that aren’t really loving). Great post, great recommendation. I loved that too! Liz hits again on those themes in MY NOT-SO STILL LIFE, so I think it’s going to resonate with a lot of teens (and adults like us! ).